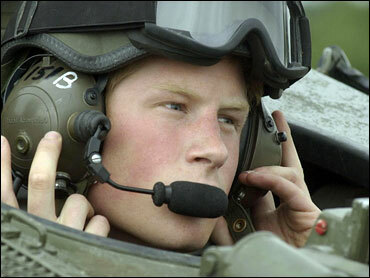 Prince Harry, the third-in-line to the British throne, will be deployed to Iraq, the Ministry of Defense said Thursday. His regiment, the Blues and Royals, is expected to deploy to Iraq this spring. Harry could become the first royal to see combat since his uncle, Prince Andrew, served in the Falklands war against Argentina in 1982. Harry, a second lieutenant, has expressed his desire to serve alongside his comrades in Iraq, saying that there was "no way" he was going to undergo rigorous training and then stay away from the battlefield. He graduated last year from Royal Military Academy at Sandhurst. Britain's Ministry of Defense has previously said that Harry could be kept out of situations where his presence could jeopardize his comrades. CBS News correspondent Mark Phillips reports that people in Britain are worried, not just for Harry's personal safety, but for what it would mean for the nation if something were to happen to him. Royal watcher Victoria Mather tells CBS News that if the prince were to be killed by Iraq's insurgency, "of course, it would be a propaganda victory, huge, huge." Harry's regiment is trained for front-line duty, and may end up patrolling the border with Iran. Whereas the prince stood out among his fellow cadets at the Sandhurst Academy due to the constant attention and easy recognition, Phillips says in Iraq, he'll be "just another grunt in uniform," making it difficult for the enemy to single him out on the battle field. The 22-year-old prince, known as Troop Commander Wales by his regiment, has trained to command 11 soldiers and four Scimitar tanks. In joining the military, Harry followed a royal tradition: his father, Prince Charles, was a pilot with the Royal Air Force and Royal Navy, and a ship commander, and Harry's grandfather, Prince Philip, had a distinguished career in the Royal Navy during World War II. Prince Andrew was a Royal Navy pilot. On Wednesday, Prime Minister Tony Blair announced that Britain would be reducing its commitment in Iraq, withdrawing 1,600 soldiers in the next few months.